Positive thinking, Upward mobility - In. Downhill slide or hamster roll - Out. Narendra Modi –- In. Vote Bank Politics of Divide and Rule - –Out. 2014 National Elections will bring in a new government. Predictions are that it will be an NDA Government with the BJP as a major partner and Narendra Modi at the helm. We may have voted and supported Modi’s opponents. Irrespective, the collective hope is that the nation would be forward looking, and minds and learning would be devoted to aid development and not to prove past statements or views as correct. In case Modi does become the Prime Minister of India, the hope is that the nation will support him and he will succeed in ModiFying the fractured face of India. These cracks in the face have come from decades of vote bank politics in the names of socialism and secularism. We all value freedom as a basic right and neccessity, yet some of us do not allow others to have even a perfectly honest personal opinion, without ascribing motives. Such "Freedom" could mean a regimented society, or a politically correct dispensation, without any scope of personal expression. Given that consideration, we decided that we should bell the cat and speak our views, as we hold them and let others express their own views through the medium of Shehjar. We are however not going to make the mistake of calling our views absolute facts that you are to accept. You could write back to us with your contending views and as much as possible, we will publish those. It required hard thought to open Shehjar as a platform to present what may be conflicting opinions but then we have no vested interests and healthy debate should eventually bring some form of consensus. If not, it will at least be a presentation of opposing viewpoints. We support Mr. Narendra Modi’s contention that instead of appeasing voter groups created by manner of region, religion or caste, the government should benefit the common citizens of India, who have similar needs. We truly believe that these thoughts if accepted by all segments of the Indian population will bring about real secularism and positive attitude towards work and development. We believe that by thus ModiFying the face of India, we will change politics and discourse for generations, to focus debate on matters like the economy, education, security, immigration, health, industry and such. If you think differently, it still means that you care, but in your own way and with your set of beliefs. Having said that, we would like to present some of our views on some of the people and parties who were engaged in the recent National Elections in India and who could also be involved in the near term Assembly elections. When they cannot beat him while debating issues or in elections, they attack his person. He is painted as a dictator instead of a leader who he is, as beholden to industrialists instead of as a champion of the economy he is, supporter of murderers instead of a guiltless person as the courts have ruled him to be. They make stories about him and those around him and hope that these stick. Hypothetical stories are spread to prove the viability of illogic. Now, one can believe in facts or otherwise. The fact is that Mr. Narendra Modi has been under the most intense scrutiny of anyone. A government in power used all of its machinery in trying to get at him. Yet, the Supreme Court of the land has exonerated him. He is promising development and a common standard applicable to all citizens irrespective of religion, caste or region.Why not give him an opportunity as he also seems to have a clear mandate of the people. Regarding personal grudges and bygones, we have to let go of those and make a best effort to support building of an honestly secular nation and not one based on pretentious appeasement of voter groups, but which encourages superstition, casteism, fear mongering and ghettoism. So many people from Gujarat were convicted for the riots there. I am not aware of a politician or person from Kashmir who was convicted for the killings and exodus of hundreds of thousands of Kashmiris. Mufti Syed's role has been called into question and so has Farooq Abdullah's. Forget them, even known terrorists and murderers like Yasin Malik and Bitta Karate are paraded as Gandhians. Malik even speaks about peace at international conferences. The big point: It is time for reconciliation. Think about South Africa. If they did not have the Truth and Reconciliation commission, how could the Whites and Native Africans lived together in the same country. We live in the U.S, in the Gulf, in the Metro Cities of India and have traveled the world. Let us all move forward together and aim to improve the lot of the people through development. Let religion be a deep matter but in one's personal and even in community space, all in a positive manner. Regarding his support for industry in Gujarat, politicians also have to double up as salesmen and bring industry and business home. It is not bad if they do that. It is one of their key jobs. Big businesses, especially those into infrastructure projects need to invest big money and for that they require government support and its assurances. Energy, Manufacturing, Shipping, they all need government support. Even the U.S.A bailed out its Car industry and its Banking and Finance Sectors. The US has enormous subsidies and protections for itsTelecommunications, Utilities, Oil and Gas Industries as well as for its Agriculture and Farm Sectors. Korea has entered the US market with its cars due to extensive support from its government. Samsung and other Korean brands are popular the world over and these companies get huge government support. For this kind of support, the common citizens of these countries consider their governments as economy, people and employment friendly and not otherwise. It is sad that instead of going forward and embracing industry and entrepreneurship development, leftist politicians are painting it as criminal. Politicians should support industry and its growth to benefit the economy. The major security, social and foreign intervention/ insurgency problems of India are hidden from people or not spoken about. When the tinder keg India is sitting on explodes, many will wish that we had not closed our eyes shut when we had a chance to see the issues and solve these. Meanwhile, many “intellectuals” use their free college "education" in India to write interesting rants against people of local faith, especially those who want to be socially and politically conscious. Mr. Narendra Modi is expected to directly address the internal security issues facing the country. Beware of this breed of “professional” reporters and journalists who will do anything for their paymasters. They have become too used to manufacturing facts and preaching their positions rather than researching facts and reporting honestly. Sadly, some people even from within the Kashmiri Hindu community who you may have loved and believed in have climbed on this “professional” train. I hope that we individually and India collectively decides to call out these people and it does not remain fashionable and paying for these so called "journalists" to patronize readers with messages based on their fake stories, created for effect. These journalists want to "educate" others and not get any feedback different from what they want to hear. So they carefully choose people for soundbites. They get “embedded” with their favorites and then post stories while being part of the entourage. I pity the venality that guides these people to believe that they know the thoughts of people better than the those who have them. These intellectualizing jokers need to stop patronizing. If we just dump them and their attempts at misleading us, they would be forced to get a real job, or to really follow their journalistic ideal. Aam Aadmi Party came into being riding on support for an anti-corruption platform built by Anna. Anna saw his as a people's movement to clean the polity and not as a vehicle for political glory and power for self. At some point Kejriwal hijacked the platform and Aam Aadmi was blinded enough not to see this as a coup. One could question the political space that AAP is trying to occupy. It is slotting itself as a mostly leftist populist, somewhat anarchist/ disruptionist group in a city setting. This is no different from what Laloo did in Bihar in his ascent to power, Mayawati in U.P, Mulayam in U.P, Mamata in Bengal, only difference being that they did it in a regional setting. How have these named leaders positively changed the politics of the country? The comparison is deliberate. Kejriwal’s policies based on populism are the same. Leftism - socialism, freebies, road shows, craving for minority and bulk votes, ... everything is the same. He may have a certain degree which makes people think he is but that does not actually make him smarter than the others. Supporting AAP in its current Avatar is creating a recipe for a fractured mandate where all the different warlords are to be given their pounds of flesh and continually appeased. We need national governments. India does not need all local parties based on religion, caste, region .... to get 5-20 MPs and prevent a nation from being together. India does not need such fractured mandates in the states either. It was painted as a David vs Goliath fight and it was. But not in the way one may think. On the one hand was Kejriwal, backed by all the powers that be, have been, all the communists, all the communalists, JDU, National Apparatus of AAP with an in-the-city army of activists estimated at 50,000, unlimited funding, tacit support from Congress, BSP, SP who have fielded non-contestants … On the other hand was Modi and his band of supporters. Kejriwal lost his mantra, his ideology, his projection, his magic by single-mindedly being focused against Modi. He put up candidates in more than 400 constituencies but pulled all AAP resources to beat one man. Giving up on creating worthy fights in scores of constituencies just to fight Modi in Varanasi was a selfish attempt to stay relevant. It was nothing but a marketing action where a new brand was advertising comparison with a quality product to draw some placement. "A man is known by the company he keeps." If you apply that yardstick to Kejri, he gave up on Anna, Kiran Bedi and added strange bedfellows. Add to that AAP engaged a battery of "professional," embedded journalists to manufacture Kejriwal stories and make him a credible option in Varanasi. India needs to be able to give sincere compliments and accept these as well. Hearts need to be mended and people need to come together. Recently the politician Amar Singh spoke positively about Narendra Modi in an eloquent manner. Why criticize him for that and ascribe motives? Let us appreciate the good when it happens. The environment of polarization has to change into one of balanced discussion instead. Why not support or oppose actions/ plans/ projects instead of a person? The tide against polarization can change quickly if arguments are made without generalizations about people or groups. India needs to make better of the choices. Conflict or resolution? War or peace? Dialog or rabble rousing? Better future for our children or the suffocation of hope? Mixed society or a monolithic one? Equal law and its application or separate laws? We are part of a bigger world too. People who come to power and their supporters would be well advised to not generalize against entire communities and groups of people. Why speak ill about people they do not even know of? A majority of people are open-minded and respectful of other cultures and even welcoming. Communal people are encouraged in the practice of their ideology by generalized comments against entire groups. Young Indians have the passion and energy and lack fear. Therefore it is important that the youth not go by perception alone and follow someone else's wisdom or lack of blindly. Look at all perspectives and form a considered, balanced opinion. The focus could be on local and national matters such as security, employment, industry, economy, welfare, education, among others. Let there be no hiding every wrong doing under the tag of "secular." It is really important but not only as a matter of lip service. Appeasement, canvassing of the voter on the basis of his/her religion, caste, region alone must stop. Finally, we cannot afford a discriminating government in India. If a country starts discriminating based on religion, it does not end there. Then there will be further divisions based on sect, cast, region..... all the way down to the individual unit. Misleading information and fear mongering that is created by certain groups is what educated and informed people have to ignore. The U.S.A and developed countries guard the freedoms of all equally, irrespective of anything and the Indian constitution provisions that too. That is how it should be in actual practice, always and everywhere. We sincerely believe that, from our core, and may it be so. 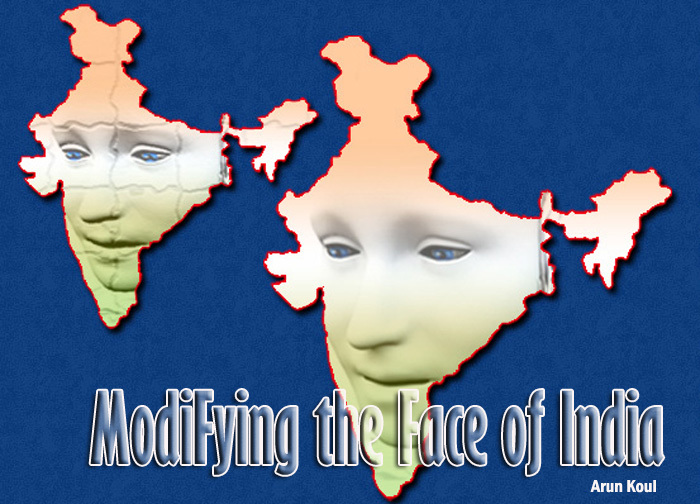 That would be ModiFying the face of India, as we understand and support wholeheartedly.